How would you describe "Surtur Rising" to your fans (the ones who actually know every part of your music), but also to the ones that are not very familiar with your music and lyrics? Surtur rising is all in all a classic Amon album. We have continued where Twilight of the thunder god ended, with an album filled with heavy death metal spiced up with a bunch of very melodic riffs. A few added elements like chellos and other instrument are visible in the back of the mix. The Lyrics deals with norse mythology and vikings in general. Blood fire death all the way. Now anyone can browse the web and find out more about Surtur, but why did Amon Amarth chose him as the main character of this album, what was more interesting in its story for you than in others? Surtur is a very impressive character beeing a fire giant. We have always had fire as our main element on covers and merchandise so it was easy choice when we were looking for a main guy to base the whole album on. He is also a very violent guy and I think he fits our music quite well. How much do you think the final cover artwork and booklet content fits the general concept of the album, did you have a final word on it or was it presented to you as a final product? I think they go togeather quite well, at least that was the plan when we started planning the whole album/albumcover over a year ago. We have always been involved in the whole production of our albums, we use artists that puts our ideas on paper. We have worked with the artist Tom Thiel on previous albums so we knew he would deliver something we would like. You're starting a US tour soon, any "special effects" planned for the new live gigs, related to the concept of the album? Not for the US tour, it is difficult to have special effects when you play club shows across the atlantic, it would cost to much to bring stuff over. This time we will try a new thing where we don't have any opening acts, it is only Amon amarth performing the whole new album in it's entire followed by another set where we play a normal best of set. It's a night with Amon Amarth. 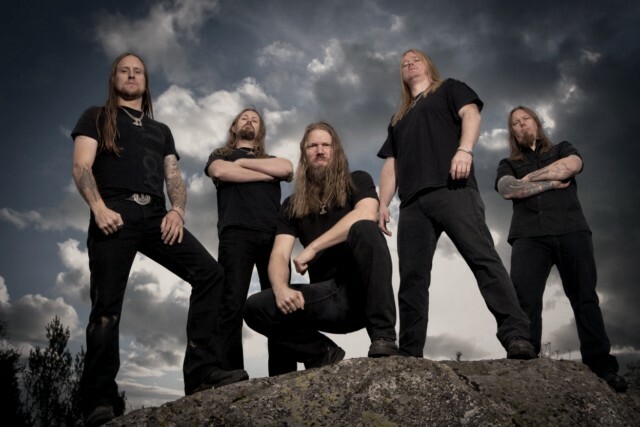 What's the plan for Amon Amarth after touring the US? After the US tour we head back to Europe for a couple of weeks of touring ending with the three Metal fest festival shows in Germany, Austria and Switzerland. We wont do any festivals this summer exept for Tuska festival in Finland so we'll have almost two whole month of before we continue touring the world. Amon Amarth will reach its 20th year of activity next year, you're one of the leading bands in the worldwide metal scene, but are you still interested in the underground scene, any new bands attracted your attention? Honestly I cant say that I follow the underground scene very much, I get alot of stuff when we're touring and ever now and then you find something interesting but that is about it. I listen to older heavy metal right now, bands that I grew up with that I am re-descovering. Through videos, cover artworks, image, you've reached a high visual level and I think you managed to paint very well your mythological stories, but have you ever thought of more, I mean a video with a huge viking crowds or even a real movie or video game? A video game or a movie has been a dream for a long time but it is difficult to find something that would work. If we get an opportunity in the future we'll definately try to arrange something. Are there any tracks of yours that you love and you rarely or never played live? I have many tracks that I like but are not really good livesongs. We've have played all our songs at least one time in a live set, except for the new album of course, but we'll play it soon though. I would like to play Embraced of the endless ocean more often.